This past Sunday I trekked out to Fort Hunt Park in Alexandria, VA. It was in the 30s and still felt pretty cold. It was also the day of daylight savings, so I was extra tired from not getting as much sleep as I could. Regardless, with my Rock ‘n’ Roll Half Marathon coming up this weekend, I needed to get out and run. This race was put on by the DC Road Runners, and like usual, was very well organized. These races are “low-key”, so they are free for members of the club and only $5 for non-members. There is no shirt and no medal, but you do get a full race, complete with water stops and an official time. Not bad for the price! 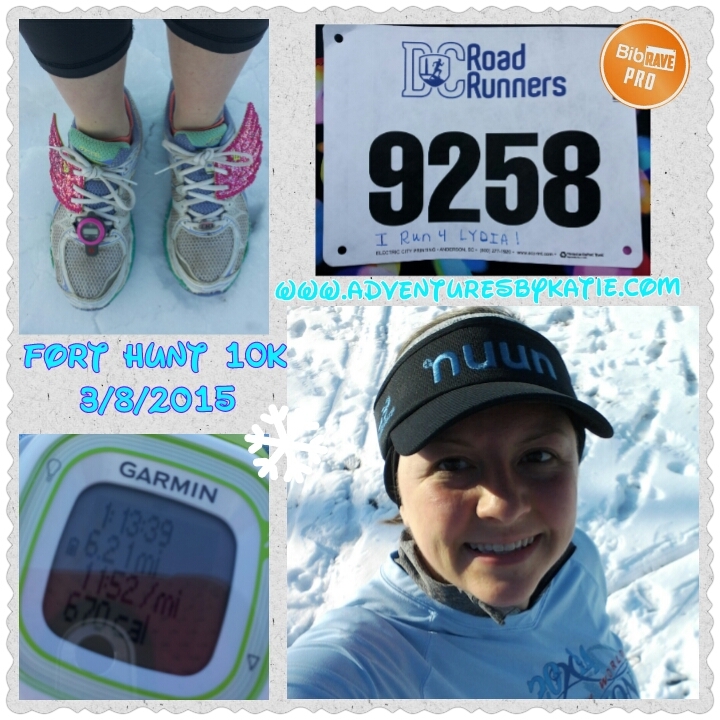 The 10k was 5 laps around the path street of Fort Hunt Park. We hit the water stop on each round, so I didn’t have to worry about carrying anything with me. It was a bit icy in spots, so I needed to be careful of my step, but I didn’t fall (yay me!). 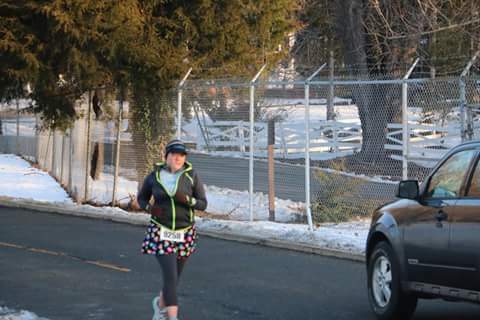 I didn’t really warm up until lap 3-4, but then I was able to shed my jacket for the last lap. I was hurting pretty bad during this race. 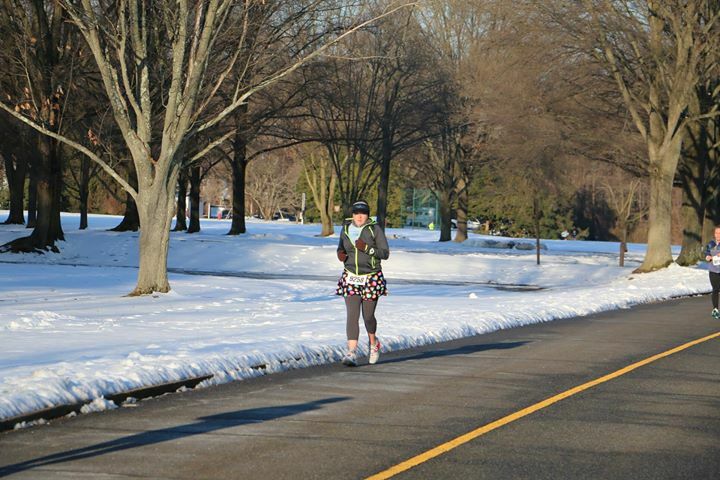 Because of all the snow, ice, cold, and laziness, it had been a few weeks since I ran. And I definitely felt it (and still do – I am so sore, you would have thought I ran a marathon!). My legs felt like lead and it took a lot out of me to keep going. I did stick to my intervals (run 2/walk 1), though, which made me a bit proud, even if I was slow. My final time was 1:13:38. I was second to last to finish. I guess that’s what I get for not getting out there more! Oh well. I just cannot believe how tough you Northern runners are, getting out there and running in the SNOW!!! Awesome job! Thanks for linking up with us today! great job! it was icy at points out there – i saw you racing and when you finished -you looked strong! Sometimes I really like a small local race. I have to remember this one for next year. Good job navigating that ice. Good for you for getting out and running even though the conditions weren’t great! Next story Do You Run/Walk? Previous story Do you Tsum Tsum?